Now that the LG G5 has been unveiled, some analysts feel that the phone could help LG put up some impressive numbers this year. Some of those who track smartphone shipments for a living feel that LG will ship a company record 10 million units of the phone. Jefferson Wang, a mobile and wireless analyst with IBB Consulting Group, sees the LG G5 as a phone that can impress the public. Wang points out that LG has made the phone strong in two areas that the public really cares about: photos and music. 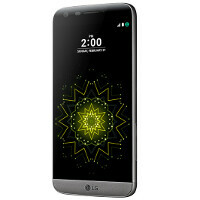 Analysts see strong accessories sales for the phone thanks to a new modular design that allows LG G5 users to insert cards that improve the handset's performance as a camera and music player. One card includes a camera grip, additional camera controls, and extra-battery life. Another card adds an audio DAC attachment to improve how music sounds on the model. The modular cards are called "LG G5 Friends." LG is looking to build on the success of the LG V10. Last year, LG was sixth in the global smartphone market with a 5.3% share, but that rose to 13.3% during the final three months of the year, thanks to the launch of the V10. LG put some of the features found on that phone on the LG G5, including the always-on secondary screen that shows notifications, the time, battery status, weather, and more. Like a politician giving up on a certain state he/she knows is unwinnable, LG has conceded China to other manufacturers. The country accounted for just 6% of LG's total revenue (including non-smartphone products) during the first three quarters of last year. North America was responsible for 28% of such sales, and South Korea made up 26%. Analysts say that LG just needs to push the marketing of the LG G5 in order to improve the company's market share. Jeff Fieldhack, research director for Counterpoint Technology Market Research, sees LG taking market share from HTC, Sony and Microsoft if it hikes its advertising budget for the phone. That just might happen. According to Juno Cho, LG’s mobile chief, "We want to give it a big drive this time, setting aside more budget for marketing than we could probably afford." Pre-orders for the LG G5 will start March 18th in the U.S. with shipments starting sometime in April. G5 = Best phone in the world. G5 with G4 design = best phone in the world. How much do those accessories cost? That is the big question that no one has answered yet. I mean is a cool concept being able to remove the battery in metal body as well as other functions but people are acting like its the first removable battery. With the s6 everyone complained that they got rid of sd card and removable battery and yet s6 outsold g4 a million times more so what makes people think g5 is going to outsell s7? The average consumer dont care about that stuff they just buy the popular devices such as apple and samsung they're not going to buy g5. The HTC Inspire was a metal unibody phone with a removable battery, and that was released in 2010. It will not out sell the su.but LG could definetly boost their sales with this phone.its just a fantastic phone!better than the s7 in my opinion..the only reason why LG cant sell more than samsung is because they dont have the mass budget for marketing as samsung does. I hope LG does sell so they can keep bringing innovation to us! it can ship but the question is,..will it sell? i think yes. 10 million wouldn't be a record since the G3 sold 10 million. They are talking about 10 million units in one year (2016), that will beat G3. LG sold 10 million G3 accumulatively since its released. http://www.phonearena.com/news/LG-G3-will-be-the-companys-first-smartphone-to-reach-10-million-units-sold_id59840 This was 3 months after the G3 release. Really? Critically panned design. Maybe. Guess time will tell.